From the get-go, this film sets the tone when we are cheekily told that “some of this actually happened.” Not that it’s based on a true story or based on actual events, but some of this might be true and other parts might be livened up a bit. Then we are thrown into a story we do not quite understand as of yet. All we know is that it’s the 1970s, the hair is crazy, the clothes are tacky by today’s standards, and America’s “Horse With No Name” still sounds good even after all these years. For me, if this film was all about the story it would be okay, but the reason to watch it is really for the characters. Each one is a caricature who we can hardly take seriously, and yet in many respects, they are going through some very serious stuff. Christian Bale is a con man with an epic comb-over, a pot belly to match, and a Bronx accident, wearing his ever-present shades. He is one of the smartest con men around, but he also has a family life since he married a widowed woman and adopted her young son. Amy Adams is the stylishly smart dame he meets at a party, and the two of them start a lucrative partnership upping the profitability of his conning enterprise. Adams character hustles everyone with her fake English accent and identity, that over time it seems like she even seems to believe it herself until it is too late. They are flying high and the two of them are drawn to the confidence and smarts they see in each other. However, in one instance they are not quite careful enough, and they have the Feds giving them heat. Namely, Bradley Cooper’s character who is out to make a name for himself. He is a man will a lot of attitude and a primped hairstyle, yet he seemingly knows very little. He forces Bale and Adams to work under him in order to trap others and of course they do. But his plan becomes so big that the con becomes extremely volatile. It involves an Atlantic City mayor played by Jeremy Renner, the Mob, some congressmen, and even a senator, who have all unwittingly gotten themselves into something illegal. Bale and Adams are trapped living lies that they must stop at some point because he has formed a bond with Renner and she is still masquerading as Lady Edith Greensley. The final act ends with one final con, and I must admit that I was satisfied with the ending because as a member of the audience I expected a twist to come and, sure enough, it came. But I would have never have guessed it. It ultimately lived up to its name American Hustle. I think what makes the performances good in this film are not the fact that they are lifelike or even realistic, but they are, in fact, larger than life. Sure, people like Irving, Richie Dimaso, Sydney Prosser, and Rosalyn probably did walk this earth, but the film highlights all their quirks and idiosyncrasies. Whether it is how they talk, dress, or even how they do their hair. Furthermore, they have even messier and crazier personal lives than their hair, and that’s saying a lot. These are not the kind of folks that you would want for friends, and yet could it be possible that there is a little bit of these characters in each one of us? Do we still live in a world where the Carmines are the victims and the real perpetrators get away scot-free? It’s something to ask ourselves. I’m not sure why people compare this film to Scorsese, perhaps because it is a crime film, it takes place in the 1970s, it features the Mob, or it shows off one of Scorsese’s acting icons in Robert de Niro. 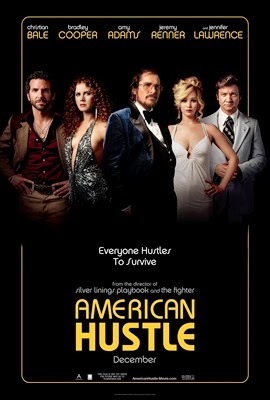 No matter the reason, American Hustle is a separate entity that seems completely different from Scorsese. That does not make it bad, just unique. And that it is. You have to give David O. Russell credit for teaming his two previous casts (The Fighter and Silver Linings Playbook) in this one for an acting extravaganza. It will be difficult to top this one as far as acting power goes. I must admit I was a sucker for the music too. This entry was posted in 2010s, Comedy, Crime, Historical and tagged Amy Adams, Bradley Cooper, Christian Bale, David O. Russell, Jennifer Lawrence, Review, Robert De Niro by 4StarFilmFan. Bookmark the permalink.